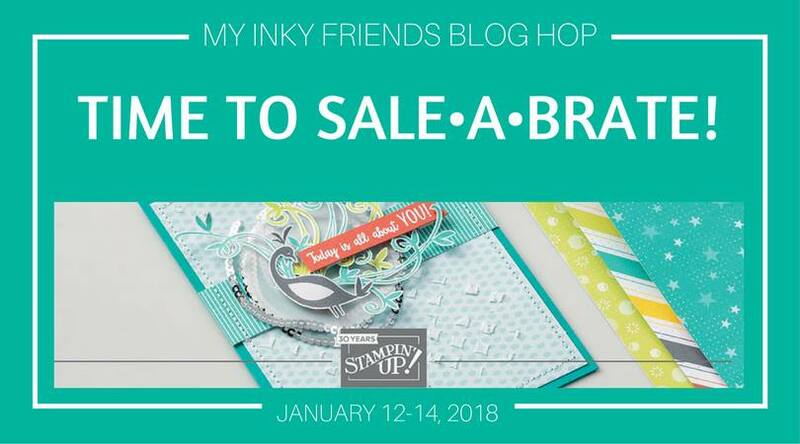 Time to Sale-A-Brate 2018 with the Inky Friends Blog Hop! 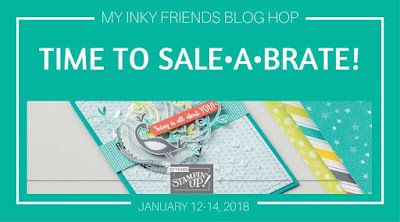 Join us as we journey through our favorites of the Sale-A-Bration offerings from Stampin' Up! Most of the products are free if you buy $50 worth of product before tax and shipping, and two of them are available if you spend $100. 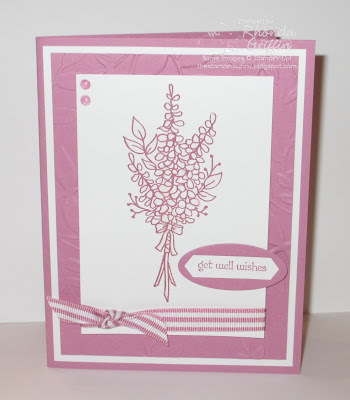 You've likely arrived from Sharleen's Stamp with Shar blog and enjoyed her creations with the Heartfelt Blooms set. Weren't her cards lovely? Also, for a full list of participants with links, go to the Inky Friends Blog. I'm using the Lots of Lavender set. I really like the bouquet and lovely coloring options for this set. This set has its own filler stamps, but whether you have the new Blends or are using a blender pen and ink, you can color a pretty bouquet with this set. First, I thought I'd show the Rose Swag stamp as an embellishment. I just embossed it in silver and colored it to match the Sweet Soiree designer series paper for a quick card that matches fairly well with that Suite. The large sentiment from Picture Perfect Birthday is lovely at the bottom of the stitched circle die cut because of the way it portioned in space. Next, I wanted to show the set using 2-step stamping as it was designed. 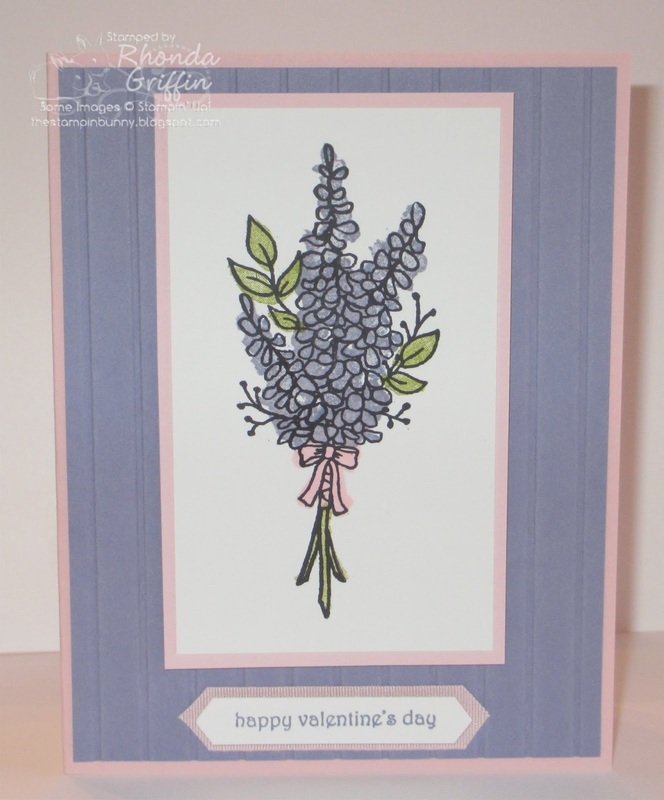 The Wisteria Wonder and Pink Pirouette create a light and soft color scheme that reminded me of Valentine's Day. The Finely Woven Ribbon is Powder Pink, but I think it is small enough (just around the sentiment) that it blends. 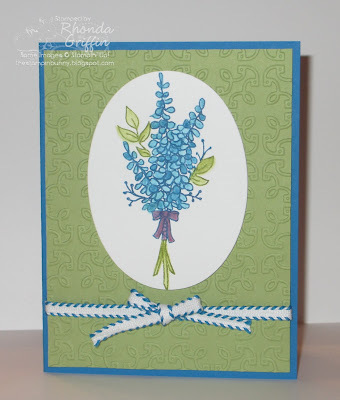 I admit when I saw this bouquet I didn't think lavender at first...They look a bit like Delphinium/Larkspur or Digitalis/foxgloves to me, so I used the color of Delphiniums for this note card. Marker to stamp was used to outline the stamp. Then, it was colored using blender pens for a soft, hazy look. Conversely, a monochrome card made with this set is also lovely. Sweet Sugarplum is one of the colors set to retire on May 31, 2018, and I will really miss it. It is difficult to see, but I used Clear Wink of Stella on the floral parts of the main image. Then I used the light Rich Razzleberry Stampin' Blends alcohol marker to color two of the glitter Epoxy Shapes for some corner embellishment. Now, let's see what the Epic Celebrations set has in store for us on Tanya's Tinkerin' in Ink blog. 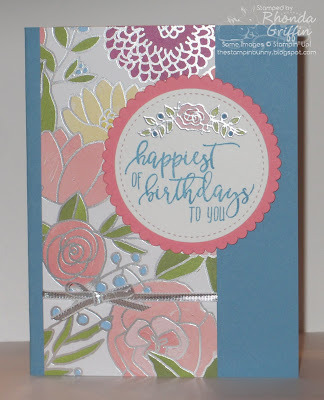 Confetti Picture Perfect Birthday Stampin' Up!